Former U.N weapons inspector Scott Ritter warned before the start of the Iraq war that claims that Saddam Hussein possessed weapons of mass destruction were false. “Some sort of chemical event took place in Khan Sheikhoun; what is very much in question is who is responsible for the release of the chemicals that caused the deaths of so many civilians. Early on, the anti-Assad opposition media outlets were labeling the Khan Sheikhoun incident as a “Sarin nerve agent” attack; one doctor affiliated with Al Qaeda sent out images and commentary via social media that documented symptoms, such as dilated pupils, that he diagnosed as stemming from exposure to Sarin nerve agent. Sarin, however, is an odorless, colorless material, dispersed as either a liquid or vapor; eyewitnesses speak of a “pungent odor” and “blue-yellow” clouds, more indicative of chlorine gas. There are no images taken of victims at the scene of the attack. Similarly, Hans Blix – the former head of the U.N. 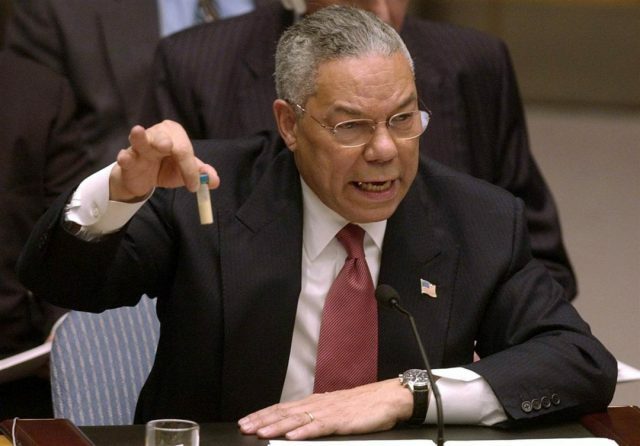 Monitoring, Verification and Inspection Commission – warned before the Iraq war that the Bush administration was greatly exaggerating the threat from Iraq’s weapons. Ex-CIA officer Philip Giraldi insists that the intelligence community and military personnel know that the intel shows that this was not an Assad attack. Specifically, Giraldi says his sources on the ground in Middle East – active duty U.S. military and intelligence stationed in the Middle East, intimately familiar with facts – say that the chemical weapons claim is a sham. Giraldi says that his sources are 100% certain the the Syrian air force hit a warehouse of rebels connected with Al Qaeda which were storing chemicals. He says that people in the American military and intelligence are “freaking out” about this, because Trump has completely misrepresented the facts regarding what happened. “This was not a sarin attack at all. Looks like either anhydrous ammonia or chlorine from infrastructure destruction. Sarin does not work as shown on tv video photos reports. I think … someone blew up anhydrous ammonia plant or supply or chlorine supply. “One intelligence source told me that the most likely scenario was a staged event by the rebels intended to force Trump to reverse a policy, announced only days earlier, that the U.S. government would no longer seek “regime change” in Syria and would focus on attacking the common enemy, Islamic terror groups that represent the core of the rebel forces. And the former UK Ambassador to Syria told the BBC there was “no proof” of a chemical weapons attack, and that it would make no sense for Assad to have done so. Postscript: The guy who supplied “evidence” on the supposed gas attack is a “committed jihadist” according to the MI6.